The Tipton High School Lady Blue Devils won the 2A sectional championship at Taylor High School this past week end. 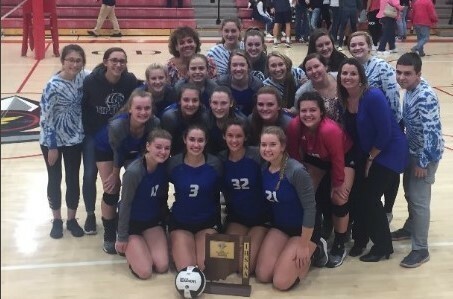 While Lady Blue Devils Teams have found success in basketball and soccer, this is the FIRST sectional championship for a Lady Blue Devils Volleyball Team. Congratulations! The Lady Blue Devils beat the Oak Hill Golden Eagles 24-26, 25-16, 28-26, 25-19 in the championship game. Earlier in the day, Tipton beat Eastbrook 25-17, 25-23, 22-25, 25-18 in the semifinal round. The Lady Blue Devils advance to the Taylor Regional on Saturday, October 20. They'll play Clinton Prairie in the semifinal round at 10:00 AM.